Wonderfully practical, these Gateleg drop leaf tables are a clever way of saving space. Featuring drop leaves that can be folded down effortlessly, these folding wooden tables are extremely versatile and a perfect, neat option for extra space. 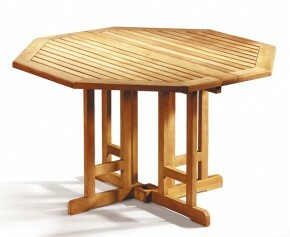 Made out of the finest grade-A teak, a teak drop down table is guaranteed extreme durability and longevity. This Berrington teak circular drop leaf table is ideal for entertaining your family or groups of friends, comfortably seating up to six people. 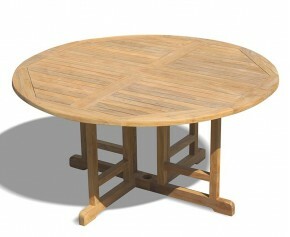 Enjoy fine alfresco dining then fold the circular drop leaf table away when you wish to reclaim your space. Able to remain outside all year round no matter the weather, our Gateleg drop leaf tables require minimum maintenance and will provide you with long lasting al fresco dining for years to come. Offering a wide range of sizes and styles, from our Brompton folding wooden tables to our stylish Shelley teak drop down tables, you are sure to find the perfect style to fit your purpose. 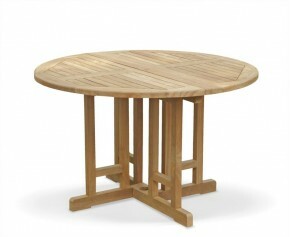 View our selection of gateleg drop leaf tables below.